While window treatments are a beautiful way to add class and elegance to any room, they can also be a practical way to enhance your space. Below are the top 6 reasons to consider custom motorized window treatments for your home. With a custom motorized window treatment, those hard-to-reach window coverings are simple to control. You no longer need to climb into the bathtub, reach over furniture, or climb a ladder in a two story foyer to adjust blinds and shades. Are you annoyed by glare while watching TV, surfing the web or reading the paper? 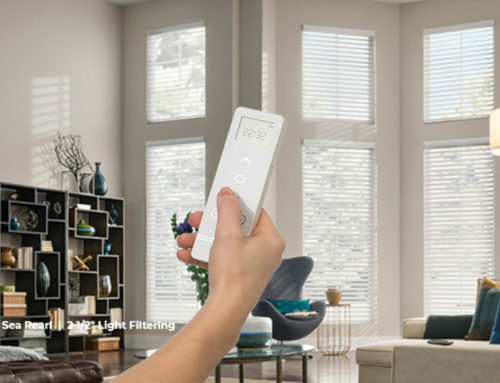 At the touch of a button, your blinds and shades will open or close to adjust to the changing sunlight in your room. A custom motorized window treatment solves the problem of trying to adjust large or heavy shades. They provide ease of use for the elderly or handicapped. It also simplifies the tedious task of raising and lowering a group of coverings. The 20 channel remote control will easily adjust a room full of coverings! A custom motorized window treatment is a great way to achieve both style and functionality. Many homeowners experience the damaging effects of the sun’s UV rays on flooring, furniture, and artwork. Use a timer to automatically adjust window treatments in different areas of the house, protecting your interiors from fading. Program your blinds to open in the morning and close in the evening to give the illusion that someone is home. Enjoy your vacation with peace of mind. Programming shades to raise and lower at certain times of the day helps to manage heat gain in the summer and heat loss in the winter – reducing monthly energy bills. Ronica’s Custom Creations is ready to help you take the next step toward your custom motorized window treatments. Contact Us today.